Heat the oven to 375 ° F. Line a baking sheet with parchment paper or aluminum foil. Place the yams in a bowl large enough to toss them around, add the 2 teaspoons of olive oil, salt, and cinnamon. Mix well, transfer them to the baking sheet and roast for about 25 minutes, until starting to get brown at the edges, and is cooked through, when you test with a fork. Remove from the oven and let cool slightly. Make the dressing inside a serving bowl, by whisking together all ingredients. Add the spring mix, roasted yams, and toasted pepitas. Mix well, and add the crumbled feta on top, right before serving. Comments: I had never visited Serena’s blog , Domesticate Me, and fell in love with it upon my first contact. Must thank Mimi for the heads up about that site. I ended up ordering her book, The Dude Diet, and I absolutely love it. She is hilarious, but what’s even better, her recipes are great. I’ve tried a few already, and must say that her lightened up version of Chicken Parmigiana is a serious winner. It pleased my beloved, who is an expert on the subject. It is one of his favorite dishes, one he requests all the time. The whole gist of the book is making recipes that awe her guy – think cheeseburgers, mac and cheese, lasagna, enchiladas – but with a lot more restraint in terms of fat and calories. I gotta use a word I don’t care for: healthier versions. There, I said it. Without compromising flavor. I highly recommend her book and her blog. Just keep in mind she uses very “colorful” language… If you don’t have a problem with that, get ready for a great time. 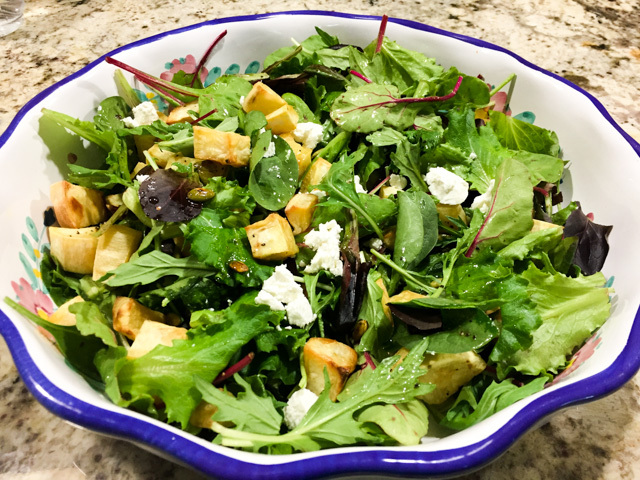 This salad is so delicious, and not at all hard to make on a weeknight. I would probably cut the yams in the morning and keep the pieces in the fridge, just to speed preparation up. Then, it’s all a matter of heating the small electric oven, roasting the yams and moving on to showtime. I think that adding pieces of avocado will make it even better, and perhaps some hard-boiled eggs instead of cheese could work well too. The pepitas are fantastic, by the way. They kind of disappeared in the photo, but their popcorny taste and crunch is superb! 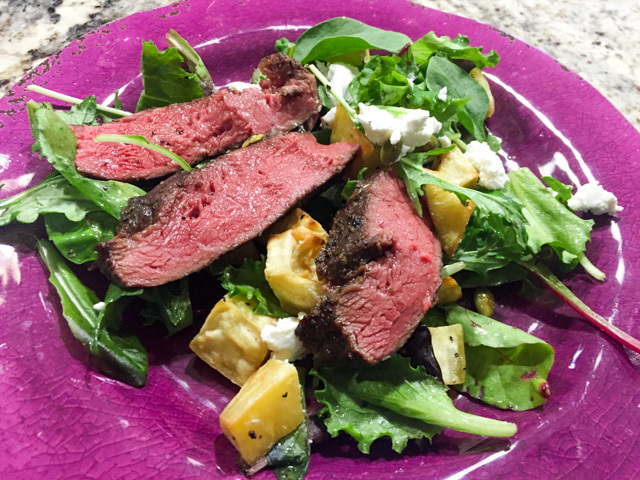 Try this salad, with or without the steak. At the risk of sounding repetitive, it is a winner. Winner, winner, salad dinner!